The WSJ story caps a recent shift in the industry – and related news coverage – toward evaluating how major healthcare providers, health plans, employers, and retailers are now using telemedicine, as opposed to the futuristic analyses of days gone by. 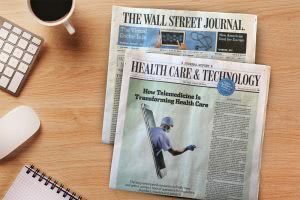 While we are of course pleased with the great coverage for American Well and some of our partners – including Anthem, Cleveland Clinic, CVS Health, Intermountain Healthcare, Nemours Children’s Health System, and UnitedHealth Group – we are just as excited to bear witness to telemedicine’s graduation from new and untested to established and transformative. Here’s to a bright future indeed.